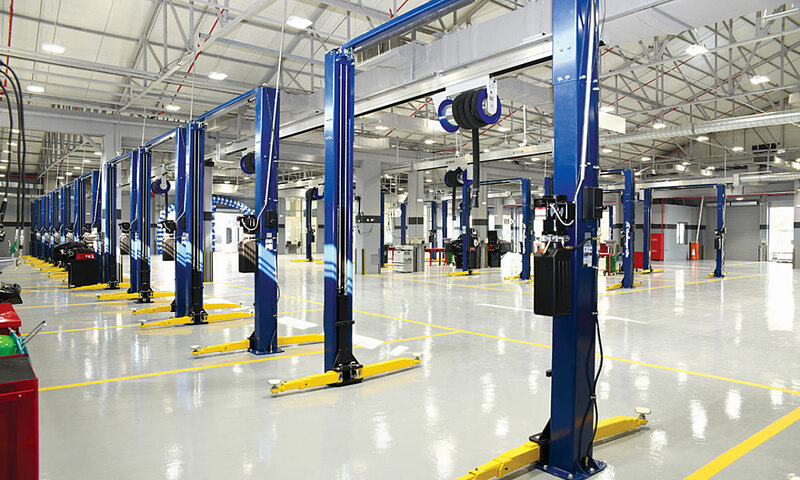 The Mopar Express Lane in Kuwait City has 32 service bays, making it the world's largest standalone Express Lane center. 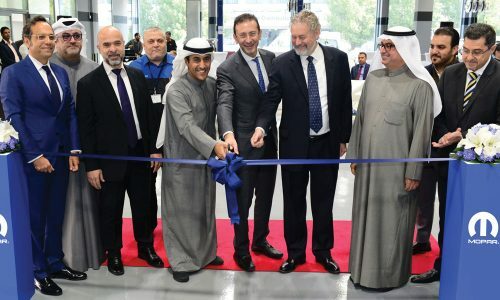 To celebrate a successful end to Express Lane’s 10th anniversary, Mopar opened the world’s largest standalone Express Lane service center this past December in Kuwait. The all-new facility is capable of servicing large numbers of vehicles rapidly and fully compliant with factory guidelines. This new facility, featuring 32 working bays and two dynamic reception lanes, covers an immense area of 3,000 square meters (32,292 square feet), allowing Mopar technicians to work on 32 vehicles simultaneously. This state-of-the-art building is temperature controlled, environmentally friendly, ‘deskless’ and mobility driven, based on throughput flow conditions. Strategically located in Shuwaikh, immediately west of Kuwait City, the latest iteration of Express Lane was built by Al Mulla & Behbehani, the sole dealer in the state of Kuwait for Alfa Romeo, Chrysler, Dodge, FIAT, Jeep® and Ram vehicles. 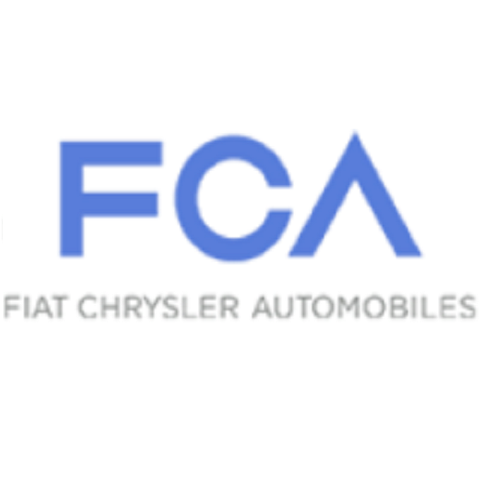 The company boasts a 250-plus strong Mopar team that includes service advisors, parts representatives, supervisors and technicians, who receive on-going training to ensure they meet FCA’s demanding global standards and meet customer expectations. Mopar now has more than 1,850 Express Lanes operations in more than 30 countries around the world, offering quick oil changes, tires, vehicle inspections and more for all FCA makes and models. Attendees at the ribbon cutting to open the Express Lane in Kuwait City were Imad Flayhan, Board Member, Al Mulla & Behbehani Motor Co.; Hani Marafi, Board Member, Al Mulla & Behbehani Motor Co.; Maher Abdulla, Director – Mopar Service, Parts, Customer Care and Supply Chain, Fiat Chrysler Automobiles Middle East FZE; Mohamad Ramadan, AGM Aftersales, Al Mulla & Behbehani Motor Co.; Tala Al Mulla, Board Member, Al Mulla & Behbehani Motor Co.; Ambassador Giuseppe Scongnamiglio, Ambassador of Italy to Kuwait; Larry Memmot, Deputy Chief of Mission, USA; Talal Behbehani, Board Member, Al Mulla & Behbehani Motor Co.; Ali Boshehri, Kuwait Mopar Club; and Oscar Rivoli, GM, Al Mulla & Behbehani Motor Co. 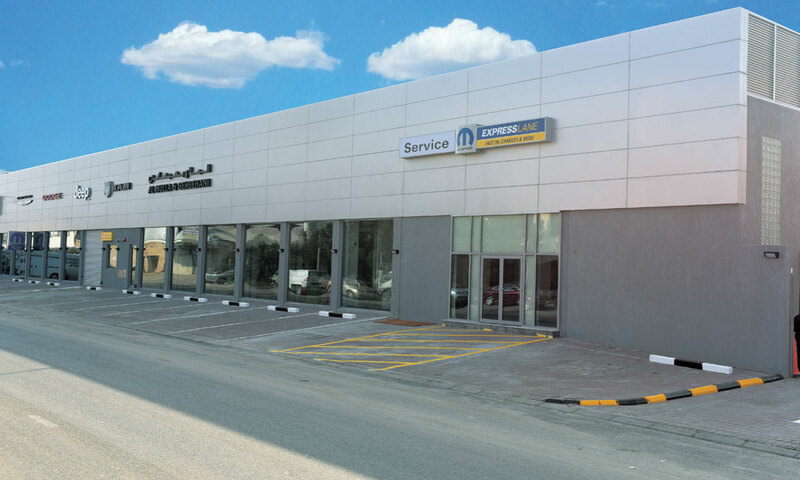 The Express Lane facility was built by was built by Al Mulla & Behbehani, the sole dealer in the state of Kuwait for Alfa Romeo, Chrysler, Dodge, Fiat, Jeep® and Ram vehicles.